UC graduate student workers represented by UAW 2865 – teaching assistants, research assistants, readers, and tutors – have an announced an Unfair Labor Practice strike next week, April 2-3. Reasons for the strike, noted the UCLA Daily Bruin, include UC's refusal to negotiate teaching assistant-to-student ratios and UC’s intimidation of workers. Meantime, UCSC union activists report that the threat of another strike, backed up by the solidarity of other campus unions, was responsible for victory in two significant grievances. UC President Napolitano has taken tuition increases "off the table" for next year despite Regents' discussions last week, reports the Ventura County Star. Instead, she wants "to keep UC tuition 'as low and predictable as possible’." In an interview with California Public Radio, Napolitano added higher education in California will require increasing partnership "with the private sector and private philanthropy as well." Meanwhile, Napolitano joined the presidents of the CSU and community college systems to make a presentation to CSU trustees on collaboration efforts between the three systems. Reuters reports that President Napolitano has "expressed skepticism about the use and cost-effectiveness of courses that are offered online" as a way to educate more students at a lower cost. At a speech last week, she said online learning is "harder than it looks and if you do it right, it doesn't save all that much money." On the same day, the New York Times reports that Yale University's former president, Richard C. Levin, will become "the chief executive of Coursera, a California-based provider of online academic courses." "The tragic story of a young lab assistant [Sheri Sangji], whose death exposed lax safety at UCLA and other universities and has led to an unprecedented criminal trial" is the subject of a Toronto Star article March 30. Lawyers for UCLA Professor Patrick Harran, the lab's principal investigator and Sangji's supervisor, have "petitioned the California Court of Appeal to dismiss the case, on the grounds that UCLA, not Harran, was Sangji’s ultimate employer." The next court date is scheduled for June 5. "Thanks to a unanimous vote of California’s Occupational Safety and Health Standards Board," according to The Pump Handle blog, "California workers will reap the benefits of more meaningful right-to-know rules than those at the federal level" with regard to chemical hazards. UPTE was one of more than 50 organizations that fought to maintain key features of California's Hazard Communication rule that had been dropped by the federal government in adopting a new globally harmonized system for classifying and labeling chemicals. The Los Angeles Times reports that fallout from affirmative action legislation is still causing divisions among the Democrats’ constituencies. The paper issued an editorial in favor of diversity and a re-examination of Prop. 209. The Merced Sun-Star offered a contrasting perspective. The University of California topped the municipal bonds calendar last week, issuing nearly $1 billion in bonds to be underwritten by Wells Fargo Securities. Meanwhile, UC’s chief financial officer will resign to become head of a Los Angeles private foundation. Today, March 31, was officially proclaimed Cesar Chavez Day by President Barack Obama. 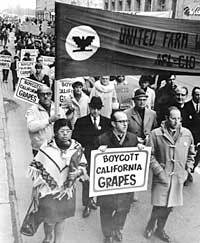 People across California and the world have long commemorated labor organizer Cesar Chavez’ birthday, marking his work organizing migrant laborers into the United Farm Workers union beginning in the 1960s (learn more at the UFW’s history page, PBS’ Fight in the Fields, of this Huffington Post review of his legacy.) Labor journalist David Bacon published this photo essay on the reality of the lives of the state’s farm workers.